Bob Marshall was a stylish inside-forward who maintained a creditable scoring record throughout his playing career. Hucknall-born, Sunderland took him to Roker Park as a seventeen-year-old and in eight years there he amassed 205 League appearances, scoring 71 times. These were golden years for the Rokerites, who finished first division runners-up in 1922-3 and took third place on three more occasions while Marshall was there. 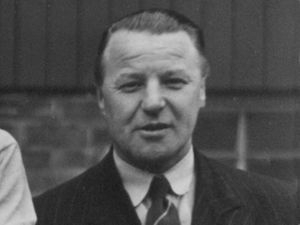 A transfer to Manchester City in 1928 brought further personal success: City were promoted to division one within months of his arrival; he gained an FA Cup winner’s medal in 1934 and helped City to their maiden first division championship in 1937 after extending his career by converting to centre-half. Retirement in 1939 saw him take over as manager of Stockport County, but he had no chance to make any impression before war broke out. He joined the army as a PT instructor and returned to Edgeley Park in 1945. County took fourth place in the Third (North) in 1947 and were showing well two years later, when Chesterfield were persuaded to offer Marshall the manager’s job in succession to Bob Brocklebank. Marshall took up the reigns in February 1949. He gave an early debut to Gordon Dale but fell out with a number of players, the most significant being Peter Robinson, the constructive wing-half. The club lost Tommy Capel to Birmingham for £10,000 in the summer of 1949 but did not adequately replace him. They couldn’t afford to: debt that had been serviceable when the main stand was built in 1936 had become a millstone round the club’s neck, thanks to the war. So no-one of any significance came in during the summer of 1949: the club stood still. Furthermore, the old scouting structure that brought diamonds from the north-east was allowed to lapse as attention was focussed on Scotland, with no discernable benefit. The side shaped well under the circumstances, rising as high as fifth in November 1949, before the goals dried up and the side slipped to finish 12th. This slump continued into the 1950-1 season, when a return of only 44 league goals proved insufficient to keep the club’s head above water. Although a decent forward was eventually signed in Bury’s Dave Massart in February, it was hopelessly insufficient and the club were relegated to the Third (North) with three games to go in 1951. If anyone was responsible for the rumoured “special arrangement” on transfers between Chesterfield and Manchester City then Marshall would seem the most obvious candidate, but the first of these transfers - the swap deal that saw Robinson and Tommy Capel arrive for Billy Linacre – took place before Marshall’s arrival and the most mysterious – the hush-hush sale of Keith Marsden – happened a long time after Marshall’s departure. The arrival of George Smith was the only deal of any significance between the sides during Marshall’s time. Bob Marshall’s period of office coincided with the beginning of a decline in the club’s fortunes that would dump them into the League’s basement and that would not turn around until 1970. Quite how much of it Marshall can be blamed for is open for debate. A millstone of debt hung round the club’s neck: although the club explored a number of options – including tentative thoughts of a ground move – to remove the debt, it wasn’t cleared until the 1970s. Despite being in debt the club was forced to spend: laying new terraces on the standing sides of the ground in 1950 was essential, but financially crippling. Marshall lacked the reputation to lure good players here and the ability to keep many of the ones he had, although most were sold from under his feet to keep the club going. Some peculiar team selections didn’t help – centre-forward and top scorer Chris Marron spent half the 1950-1 relegation season in the reserves while wing-halves and juniors were played up front in an attempt to solve a problem that didn’t quite exist (the problem was the quality of Marron’s inside-forwards), although whether we can blame Marshall for this is, again, a moot point, since the directors continued to interfere in team selection, appearing unwilling to trust the judgement of the man they appointed while disagreeing among themselves about who to play where. Perhaps this was the nub of it: in Bullock and Brocklebank, the club was blessed with a manager who had the confidence and strength of personality to keep the directors in check, and singing from the same hymn-sheet: in Marshall, perhaps, it did not. After one poor season back in Division Three (North) Bob Marshall left the club, and football; he took over as licensee at the Glapwell Hotel, remaining there until his death in 1966.